Hi everyone, I’m beyond excited (what is beyond excited, anyway? Ecstatic? Delirious? Orgasmic? Maybe all of the above) to share two big announcements today. 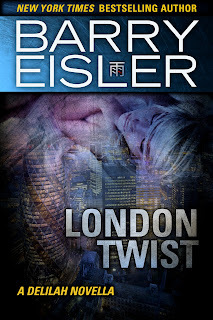 First, my new Delilah novella, London Twist, is available at last; second, my publishing contracts for my first eight novels have been amicably terminated and all rights reverted to me! For Delilah, the Mossad’s top seductress, the parameters of the assignment were routine. The contractor: MI6. The objective: infiltrate a terror network, this one operating out of London. The stakes: a series of poison gas attacks on civilian population centers. There’s just one wrinkle. The target is a woman—as smart, beautiful, and committed as Delilah herself. And for a cynical operative thrust suddenly out of her element, the twists and turns of the spy game are nowhere near as dangerous as the secrets and desires of the human heart. This story is approximately 36,000 words—the equivalent of about 145 paper pages. It is a novella, not a novel. And hey, no skipping to the dirty parts. For now, London Twist will be available exclusively in digital. Here are my reasons why, along with information on how to read the novella if you don't have a Kindle. What’s really great is that with my rights reverted, the Rain books will finally be available in digital outside the United States. This is a huge win for Rain fans in the UK, Australia, New Zealand, and elsewhere—especially at a price of US$4.99 (or foreign currency equivalent). If you care about more people reading, as I do, then you’ll want books available everywhere, at low prices, as soon as possible, in as many formats as possible. Anything else comes at the expense of readers, authors, and the general public. There’s a better way, and I’m proud to be part of it. Stay tuned for one more big announcement in the coming months—I’m busting to tell you more, but for now, mum’s the word. Thanks as always for all your support and for enjoying the stories! There's a lot to like about The Economist, in particular the magazine's long-time, free-thinking stance on gay marriage equality and an end to drug prohibition. But when it comes to western military interventions, they have a weird blind spot. I've been reading the magazine for decades, and I can't remember them ever arguing against the use, or the escalation, of western military force. Their latest war cheerleading is for western intervention in Mali, where "the real danger is that the world turns its back on another poor place threatened by jihadists." The support for a western war in Mali isn't itself surprising; as noted above, for The Economist, the support is in fact entirely consistent. What struck me was something else -- a kind of selective memory at work on the magazine's editorial board, a selective memory that's necessary for anyone who wants to continue to argue for more western involvement in foreign wars. Here's how the magazine describes the causes of strife in Mali that now require a western military response. I don't know how they managed it while keeping a straight face. Since time immemorial, lawlessness and violence have had a toehold in and around the vast Sahara desert and the terrain that stretches eastward across to Somalia in the Horn of Africa. But in the past few years the anarchy has worsened -- especially since the fall of Libya’s Muammar Qaddafi in late 2011, when arms flooded across the region’s porous borders. Hostage-taking, cash from ransoms, smuggling, drug-trafficking and brigandage have bolstered an array of gang leaders. Some of them, waving the banner of Islam, have seized on legitimate local grievances fuelled by poverty, discrimination and the mismanagement of corrupt governments. Has The Economist forgotten that the west's attack on Libya was another war The Economist cheered for? Apparently they have. Because how else can you write an article calling for more military intervention while acknowledging the new intervention is necessitated by the results of the previous intervention, without acknowledging or explaining that you yourself supported the previous intervention that caused this new problem you now argue the west must intervene to solve? Economist, meet George Orwell's Memory Hole. Islamist fighters from Libya and elsewhere brought violent jihadism to Mali in the wake of the fall of Muammar Qaddafi in 2011… How the Mali campaign develops will be shaped by yet another international link forged by extremists. After the fall of Qaddafi, an insane pack-rat when it came to lethal toys, many loyalists fled into the desert loaded with weaponry, including heavy machine guns, rocket-propelled grenades and, it is believed, shoulder-fired anti-aircraft missiles. Again, no mention of The Economist's role in cheering for the previous war that's the magazine's claimed reason for the need for a new one. And I was also struck by the reference to Qaddafi as "insane" for stockpiling arms. If the UK, America, and Qaddafi were all to open up their arms cabinets, who would have the most "lethal toys?" Given which two of these three stockpile lethal nuclear toys, singling out Qaddafi for squirreling away arms seems either demented or propagandistic or both. And given that NATO deposed Qaddafi in an operation The Economist itself supported, and given that Qaddafi was murdered in the course of that operation, it's hard to argue that there was no rational basis for his attachment to armaments. In fact, I'd argue that what's insane -- or dishonest -- would be to argue otherwise. Part of the reason war is so dangerous is because its prospect excites otherwise intelligent people to such a degree that they lose their ability to reason. When people drink, they know they're impaired. A pity more people don't recognize a similar phenomenon at work when they're advocating for war. It all puts me in mind of an Economist ad I saw recently, in which the magazine proudly quotes Oracle founder Larry Ellison as saying, "I used to think, now I just read The Economist." Perhaps, then, it would be appropriate to include this tagline under the magazine's masthead: "The Economist. The Substitute For Thought."